Rubberoofs is a professional flat roofing, family run business, aiming to stay ahead in our field by maintaining the highest standards of workmanship and using only rubber materials that we know to be the best. we serve the Newcastle and Gateshead area and in fact most of the North East. We also do guttering, facias and soffits. Our mission: to cater to our clients every roofing need quickly, and with long term efficiency! Our motto: A Good Service and a Better Roof, No promises only Proof! It Will Be our Pleasure to serve you! We are flat roofing contractors specialising in the unrivalled Firestone RubberCover flat roofing system in Newcastle Upon Tyne and the North East. We replace leaking felt flat roofs with our market leading rubber roofing system to solve your flat roof problems for good. This dedication to outstanding results, as well as superb service, has provided us with an enviable status as far as Jarrow roofers go. This burgeoning reputation has also blossomed from a number of word-of-mouth recommendations from satisfied clients. From uPVC roof line replacements, Velux Windows and small roof repairs, through to complete roof replacements and new flat roofing, we’re prepared for any job no matter what the size. We also provide a slate and tile roofing service. Falcus Roofing ltd have many satisfied and returning customers because we provide a quality and comprehensive roofing services in Gateshead and around Newcastle, with a friendly service from start to completion, and a time served and highly skilled team, you can rest assured that you are getting both excellent value for money and a personal service at each and every job we attend. 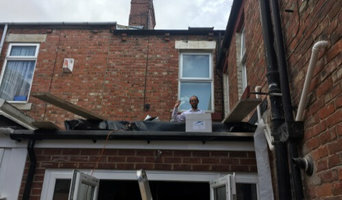 So if you're looking for a roofing company in Gateshead with many years experience in the roofing trade then look no further than Falcus Roofing ltd. Whether it’s a query or a quote, pick up the phone and call 01914357913 today or visit our contact page or send us an email. Since 2003 J Ramsay Roofing Ltd have been providing top quality roofing solutions to home and business owners who appreciate and expect excellent workmanship and unwavering integrity. As a local, family owned roofing company, we have worked hard to raise the bar for quality and professionalism at an affordable and fair price. We are a CiTB registered business employing local tradesmen and using local suppliers. All of our employees are fully trained, trustworthy and friendly and we carry full liability insurance for your complete peace of mind. For a free, no obligation quote please call 0191 4604816. If you are looking for North East Roofers, call Lord Roofing and Grounds Works today for a quote. 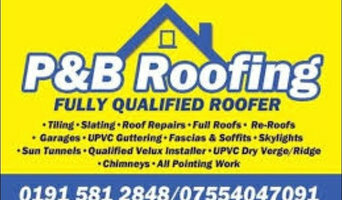 We are the Premier North East Roofing & Grounds Works Company. What we do best… Replacing old roofs with new ones. When you need a new, replacement roof, Lord Roofing should be your first choice. Why should I hire Newcastle upon Tyne, Tyne & Wear roofers to handle my roofing and guttering? There are a wide variety of materials available and your Newcastle upon Tyne, Tyne & Wear roofers can help you decide which option is best. You might look at clay, slate or concrete tiles and your choice will depend on cost, the style of your home and the local roofing style. In the North West of the UK you will see a lot more slate tiling, whilst in the South East there is an abundance of clay roofs. If you are in a conservation area you may find that your choices are more limited and you may need to look for reclaimed tiles; local Newcastle upon Tyne, Tyne & Wear roofing contractors will be knowledgeable in this area, so ask for their advice, too. How do I find good Newcastle upon Tyne, Tyne & Wear guttering specialists and roofers? Search for Newcastle upon Tyne, Tyne & Wear roofers and gutter cleaning specialists in the Find a Pro section of Houzz. Read their profiles, try to match their core skills with the problem in hand – some specialise in flat roof repair using roofing felt, others only work with roof tiles – and then see what previous customers have to say about their quality of service. Ask for personal recommendations from friends and family. Ideally your shortlisted roofing and gutter specialists or experts are members of the National Federation of Roofing Contractors (NFRC), the Guild of Master Craftsmen or the Federation of Master Builders (FMB). Each trade organisation demands a high level of expertise and imposes a code of conduct on its members. TrustMark is a government-endorsed scheme that independently assesses tradespeople and allows you to lodge a complaint if necessary – look out for that. Call them round for a consultation and make sure you request a written quote. Cheapest is not necessarily the best; more importantly, who can you work with? Find Newcastle upon Tyne, Tyne & Wear roofers and gutter cleaning professionals on Houzz. Narrow your search in the Professionals section of the website to Newcastle upon Tyne, Tyne & Wear roofer or gutter specialist. You can also look through Newcastle upon Tyne, Tyne & Wear photos by style to find a roofing project you like, then contact the specialists or roofing contractors who designed it.